In 2007, the Government Accountability Office reported that the Pentagon was unable to track about 30% of the weapons it had distributed over the past three years. 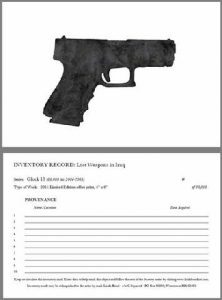 It is estimated that during this time, 110,000 AK-47 rifles and 80,000 Glock pistols went missing in Iraq and many were ultimately used to arm the insurgent fight. Statistics such as these are difficult to grasp—the numbers and consequences so enormous they boggle the mind. The contradiction of fighting while arming the enemy seems a ridiculous yet predictable outcome of the military-industrial complex, a phrase coined by President Eisenhower in reference to the close connection between armed forces, commerce, and politics. Inventory is an attempt to make the abstraction of these actions more tangible. 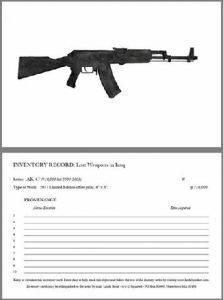 For this work, I have created 190,000 individually-numbered records for these weapons, inventory cards that give this loss both a visual and felt form. 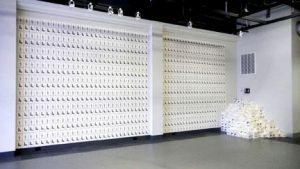 Installations of this work will present a selection of the total inventory, tailored to the space available. Inventory is a participatory project, and visitors will be encouraged to take a selection of these cards from the gallery wall to keep or pass on to others. The face of each card has an image derived from an original gunpowder drawing, while the back holds information about the item and space to record its provenance, beginning with its original exhibition venue. Participants possessing an inventory card are invited to catalog this ownership and to notify me of the card’s location by entering its number and their current zip code on my website. I will maintain an online database tracking the cards as they circulate. 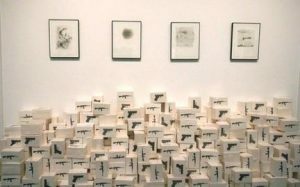 Through collaborative reenactment, Inventory both mimics and revises the course these weapons may have actually taken. Please follow the link in the left-hand sidebar to learn more about Inventory and my Kickstarter campaign to produce this project, and to register your card.